Designing an open concept space has become very popular in the past 10-15 years, no matter the size of a home – 4000 square feet or a 700 square feet apartment. An open concept home makes any space appear larger than it is by removing a solid wall and combining rooms together. There are several benefits to having an open concept home such as: improving room depth, increased natural lighting, better communication between family members and being able to see your children playing in another room. Furniture placement is key for any open concept space to flow naturally. In order to maximize the space available, don’t block natural lighting and the traffic pattern from room to room should be wide and free from obstacles (no furniture in between walking path). When purchasing furniture a few tips to keep in mind; avoid tall furniture to keep the continuity from space to space and balance the weight of the room – symmetrical layout, use a solid colour for the main piece of furniture with an accent pattern on multiple smaller pieces. Lastly, don’t place your furniture right against the wall. By leaving distance between the wall and the furniture it creates a larger feel to the space instead of feeling the furniture is barely fitting into the room because you have to push it all the way to the wall. A neutral colour scheme throughout the entire space is the easiest way to tie in all elements of the home. You’ll need to carry and repeat finishes throughout the space, for example, repeat similar patterns and textures in the accessories you select. One of the mistakes you can make when designing an open concept area is the furniture looks scattered instead of spacious. You can avoid this by adding an area rug to tie the furniture pieces together. Also, pattern direction is very important when working with an open concept area, be aware of the direction of pattern placement and how that will impact the space and ensure the pattern of the area rug is visible and not covered by furniture. 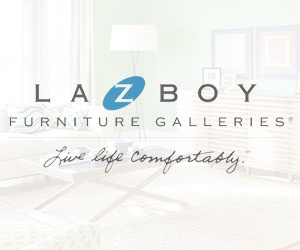 Kenji brings seven years of interior design experience to La-Z-Boy Furniture Galleries. Originally from Hong Kong, he is fluent in Cantonese, Mandarin and English. He studied interior design at BCIT and has worked for commercial companies focusing on paints, lighting, and cabinetry. Just before joining the design team at La-Z-Boy in Richmond, he was a senior interior designer at a private residential design firm for five years.